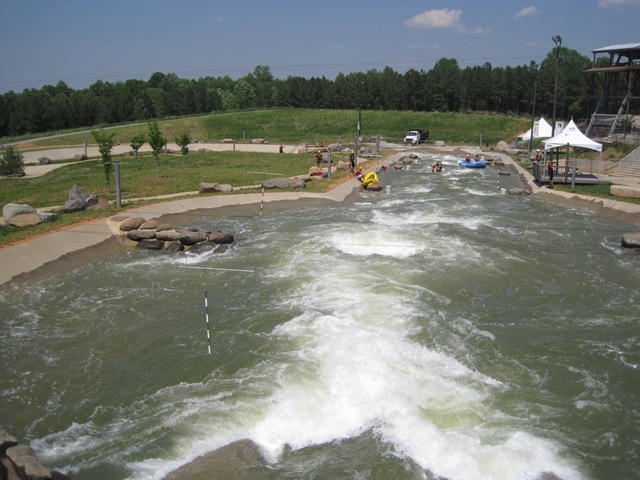 The adventures at the whitewater center didn’t stop with whitewater rafting. 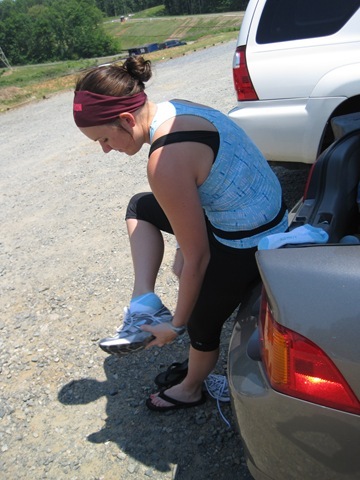 Once we got back on dry land, we headed to the car to change clothes. 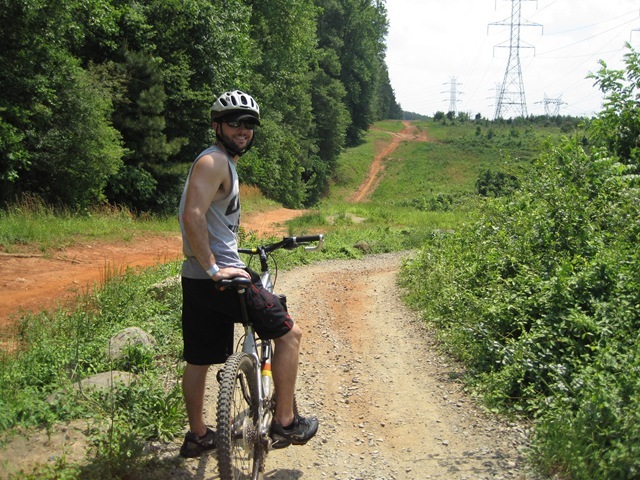 Our day pass included the rental of mountain bikes, so we took advantage! 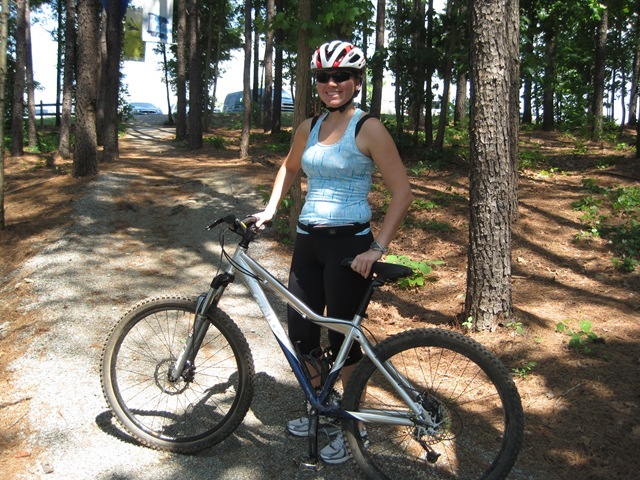 It felt really odd being on a mountain bike after riding my road bike so often. 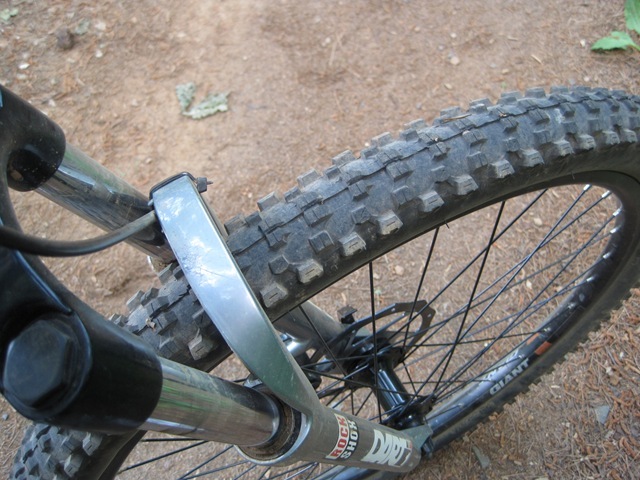 The tires were big and clunky, and I sat much more upright. 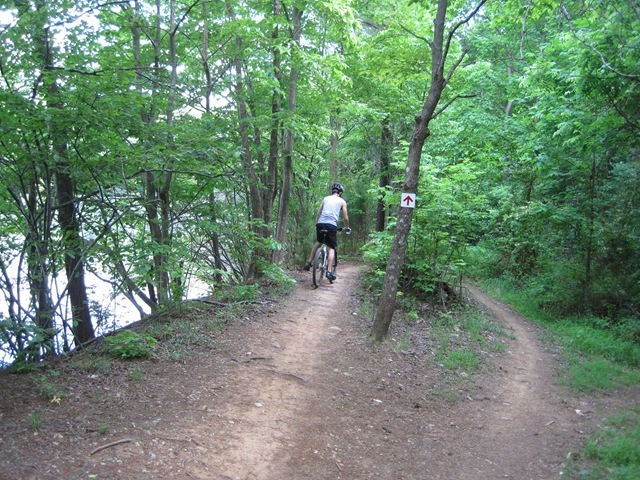 There were beginner, intermediate, and advanced trails at the center. 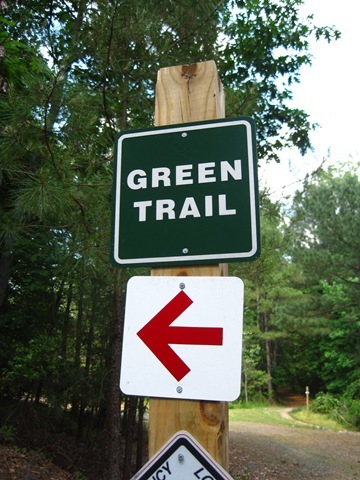 The guide warned us that their beginner trails were not easy, so we started there, on the green trail. The trail started out fairly tame. It quickly got much harder! …and branches low enough to hit your head. 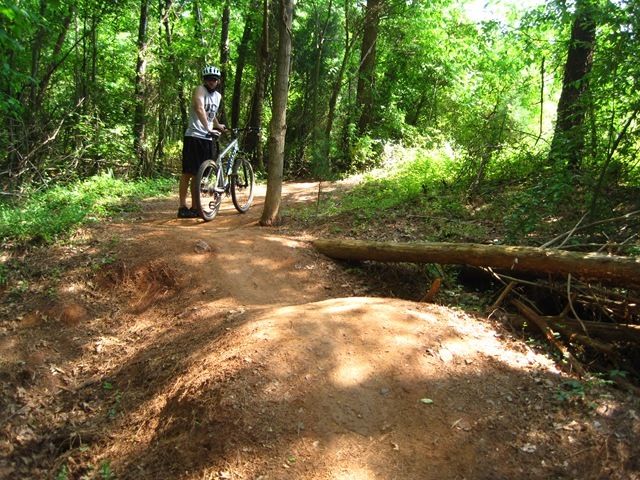 We ended up riding 4.0 miles in 1 hour. It’s crazy to think that on road bikes we can ride 16-17 miles an hour. I literally could run faster than this! It was so tiring, but it was nice to enjoy the scenery. 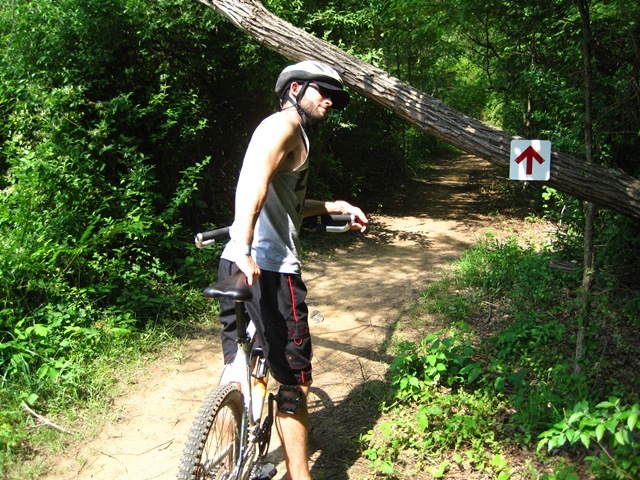 There were only a few other people on the trails, but it felt like we were exploring uncharted territory. 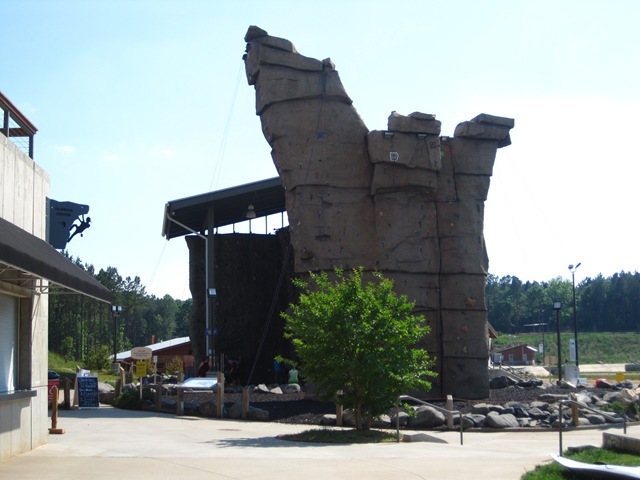 Once we turned our bikes in, we headed to the rock climbing wall. 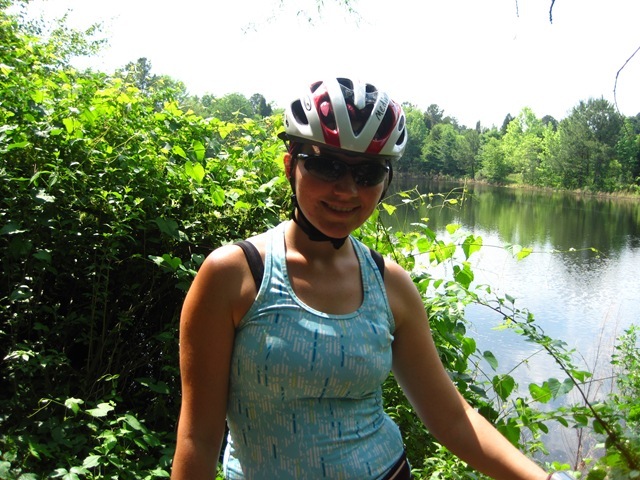 By the time we got there, I was pretty tired, but managed to muster up the energy to climb. Mark was half way up the wall by the time I reached for the first peg. He was a natural! 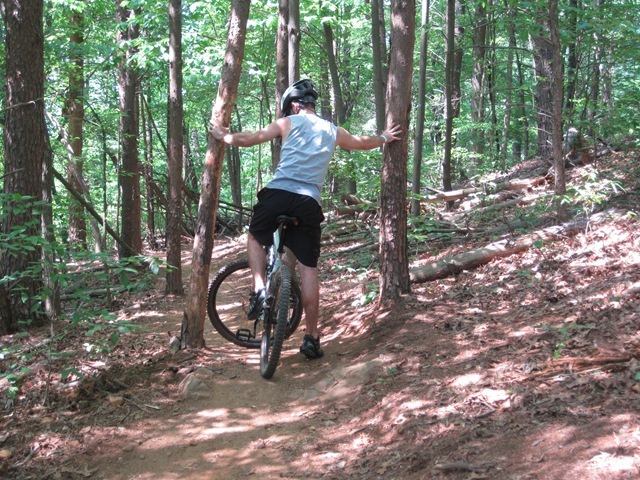 On the other hand, I was pretty slow at climbing. I started feeling a bit afraid of heights half way up and started panicking. 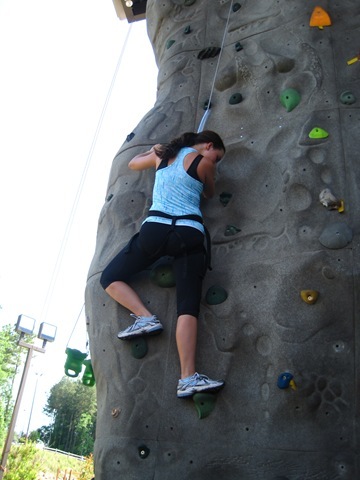 Mark coached me up to the top, but once I got there I was afraid to let go. 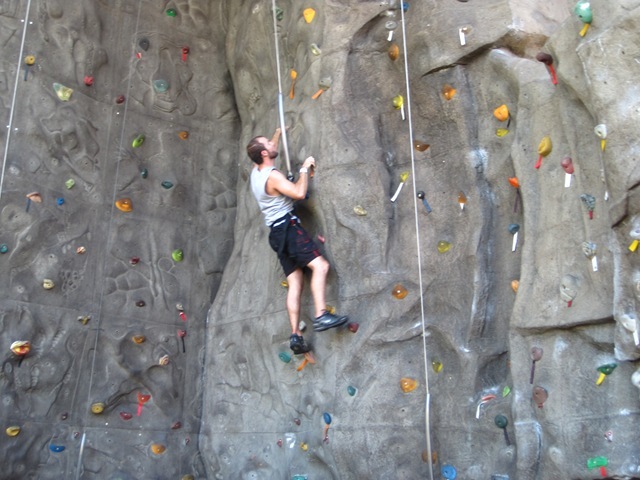 I haven’t been rock wall climbing before, even though I have had every opportunity to do so. 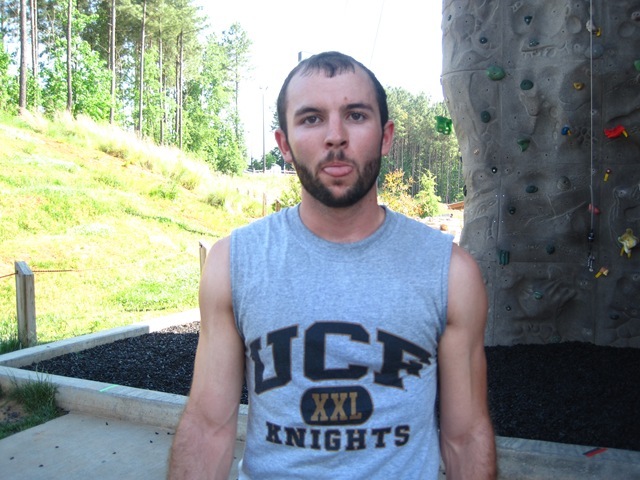 We have a tower at the UCF gym, but I have never been to it in the five years I have been in college. I might have to check it out before I graduate! 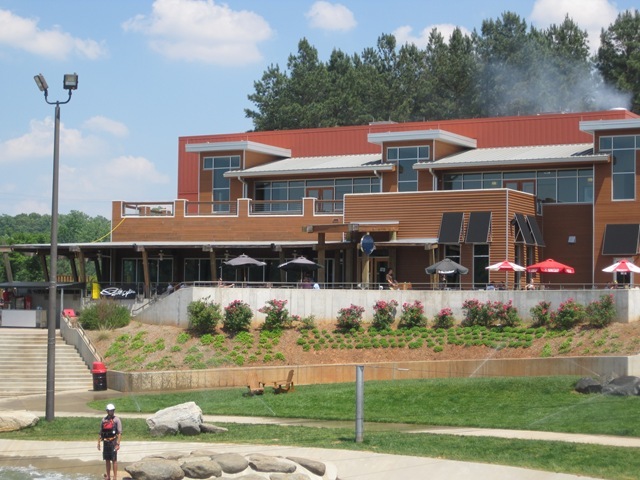 We left the whitewater center around 4:30 pm, and we were absolutely wiped! I can’t believe that in one day we managed to do so much! It was kind of like a theme park with a waiver. 😉 Except it was much more fun, and there were no long lines! 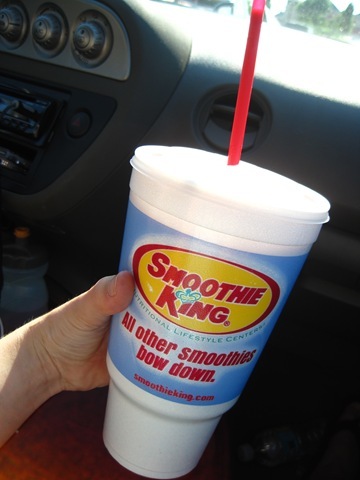 We grabbed a quick smoothie on the way out. It was something with strawberry, banana, and peanut butter. It tasted like a PB&J and tasted amazing! From the center, we drove about 90 miles to my mom’s house in Winston-Salem, NC. I couldn’t wait to see my mom and tell her about our adventures. 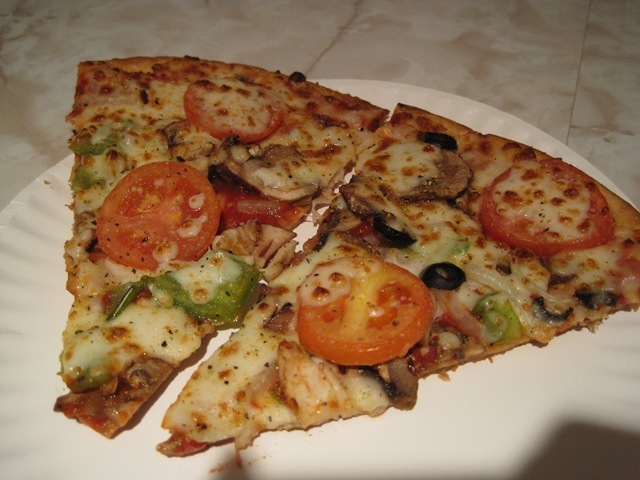 We chatted the night away over veggie pizza and beer. It was the perfect way to end such a busy day. Mark had never done any of the activities before, and I had only kayaked a handful of times. We had no idea what to expect, but we had a blast! 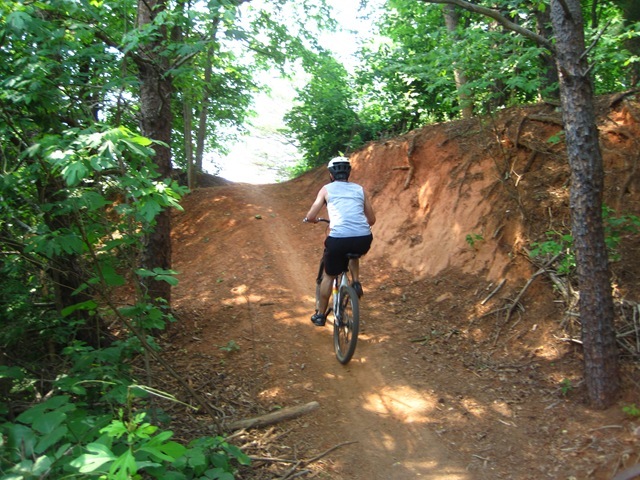 What is your favorite adventure activity? I love snow skiing, but I also really like kayaking! My vacations usually just involve going to visit family, but this time I made a detour on the way to see them! 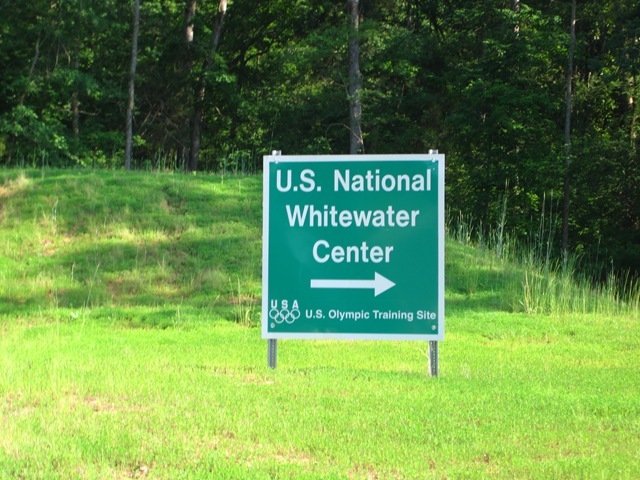 Friday morning, Mark and I woke up bright and early to head to the U.S. National Whitewater Center in Charlotte, NC. 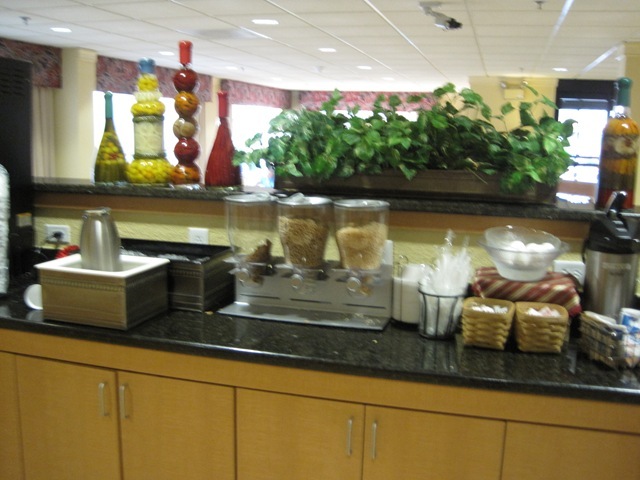 Our hotel offered free breakfast, so I grabbed some before leaving for our big day. 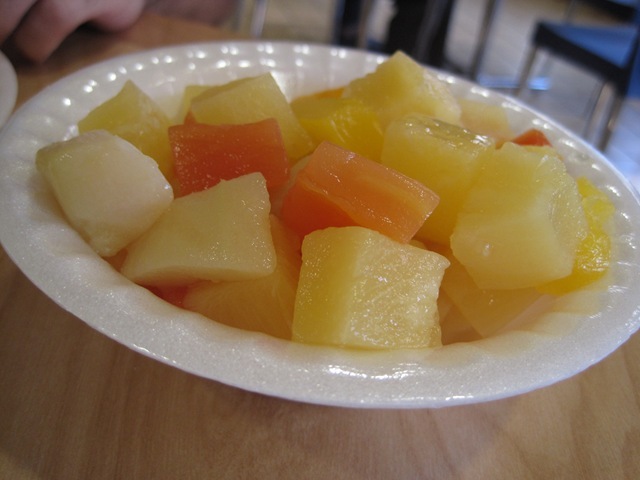 I had a bowl of mixed fruit: grapefruit, pineapple, pears, peaches. 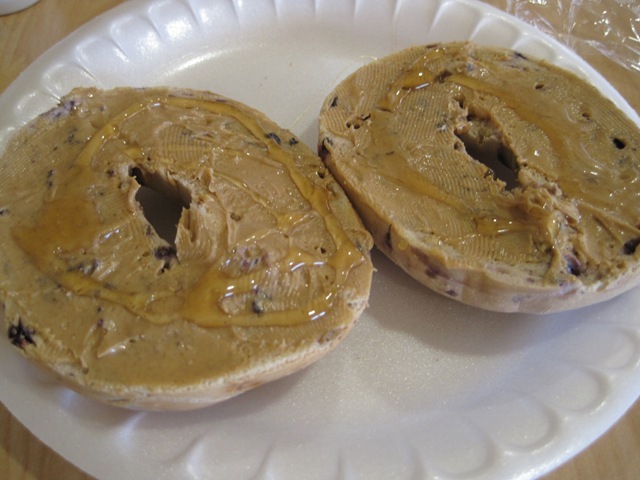 …and a toasted blueberry bagel with PB and honey. 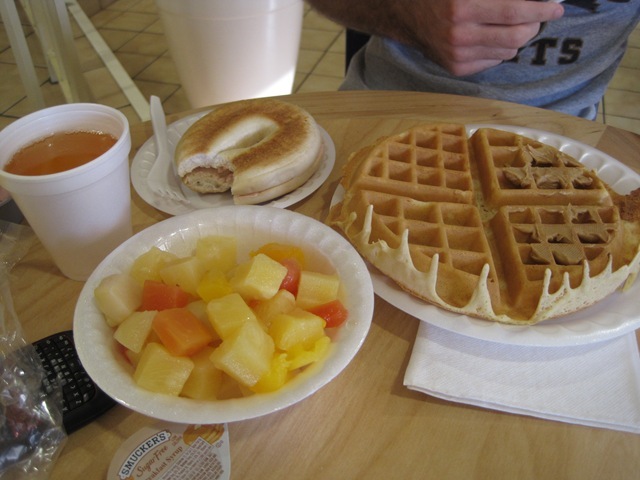 Mark had the same, plus a giant belgian waffle. 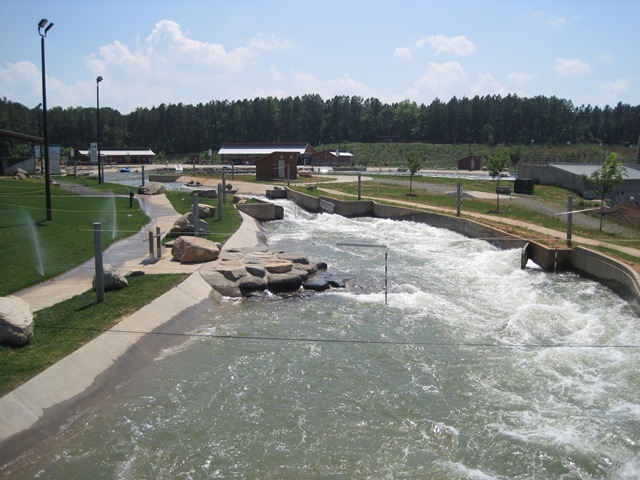 We arrived at the National Whitewater center and were pretty impressed with it. 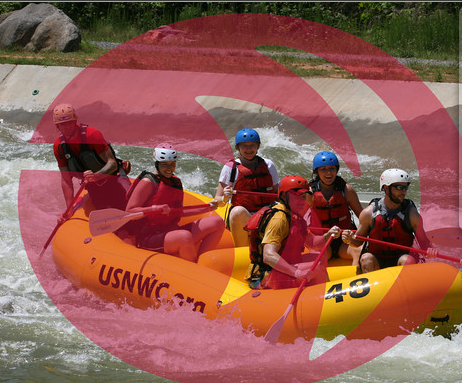 We had debated driving out to the mountains for “real” whitewater rafting but decided that it would take way too much time out of our short weekend. I was unsure how I would like a manmade river, but it turned out to be pretty awesome! 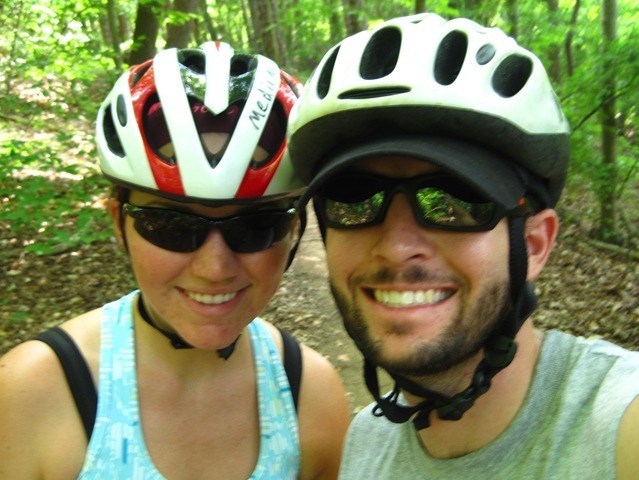 We started our morning with Flatwater River Kayaking, but all the pictures are on my disposable waterproof camera, so you’ll have to wait for those. It was a nice relaxing way to start the morning since things got pretty intense later in the day. 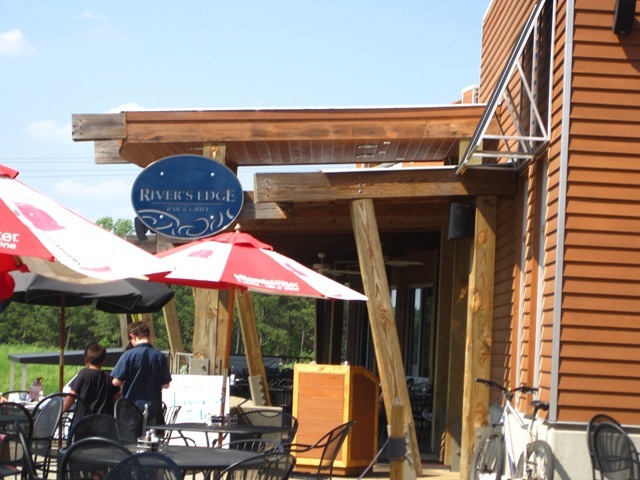 Between kayaking and rafting, we grabbed a quick bite to eat at the River’s Edge Cafe and Grill right there on the property. 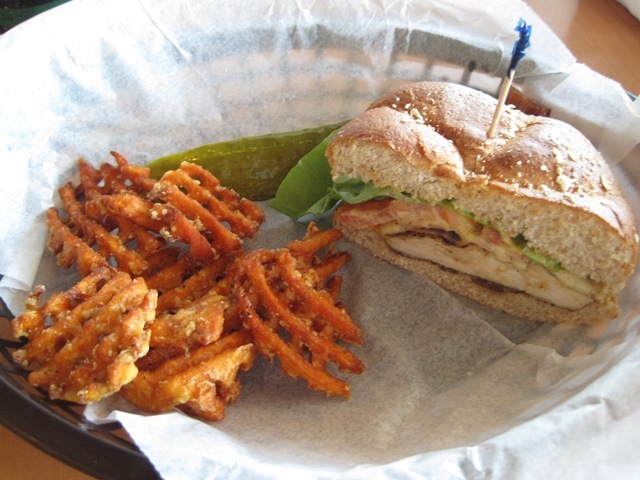 Having a full belly while rafting didn’t seem appealing, so we split a Chipotle Chicken sandwich with sweet potato waffle fries. Wow, those fries were INCREDIBLE!!! 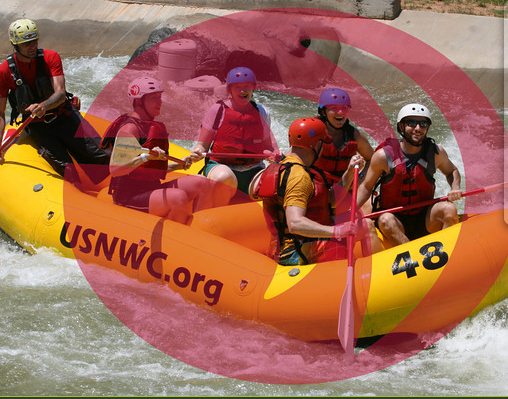 I was starting to get nervous for rafting. We had a “trip talk” before getting on the rafts where the raft guides explained everything there was to know about safety, paddling, and how to deal if you fall out of the boat. There were two channels, a training one and a competition one. 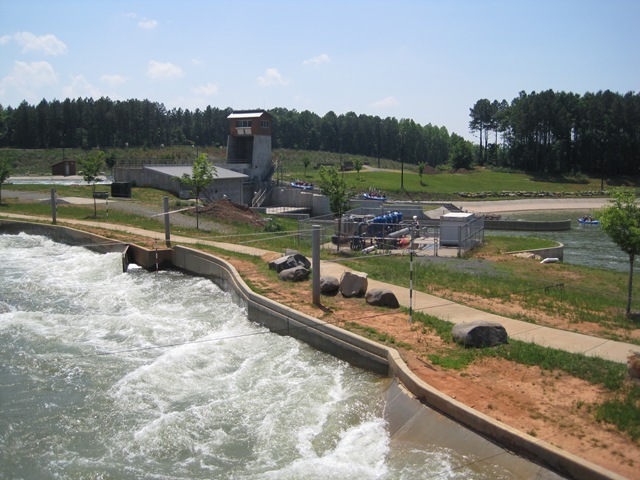 Each one has Class II-IV rapids. 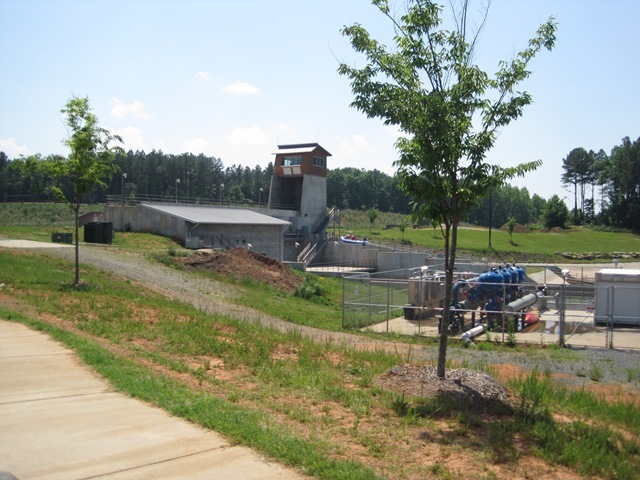 In the center, there is a giant pump that creates the intense water flow. It’s actually quite an amazing engineering feat! 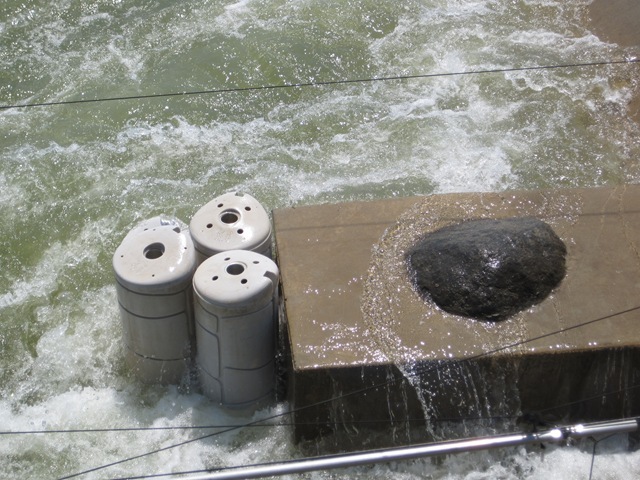 The channels had built in rocks, and removable pegs to create different level of difficulty. 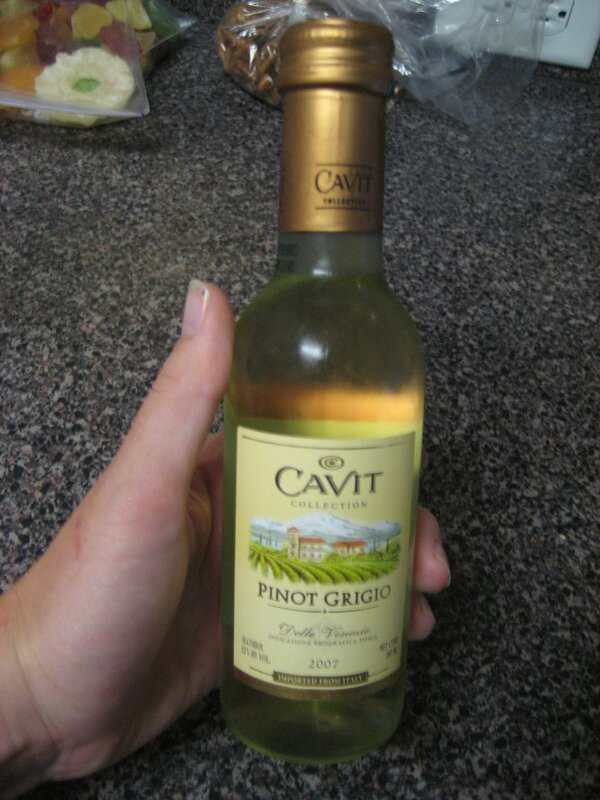 I was really impressed! Can you spot Mark and I in the photos? If not, Mark is in the front in a white helmet, and I’m right behind him in the blue helmet. Wow, that was a blast!!! 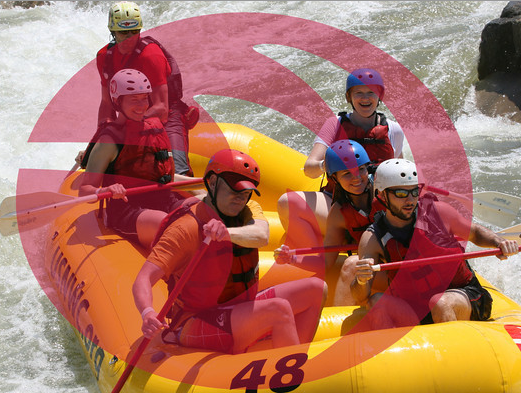 We got to raft for about an hour total, which was plenty long enough. I fell out of the boat once. It wasn’t really that scary! Mark and the guide yanked me out of the water and back into the raft in seconds. I didn’t really even know what happened because it all went so fast. Even though there are lifeguards all around ready to grab you out of the water at any minute, there was still a sense of adventure. I was worried that being at a manmade river wouldn’t feel like we were in nature, but it was out in the middle of nowhere with trees and plenty of scenic views. 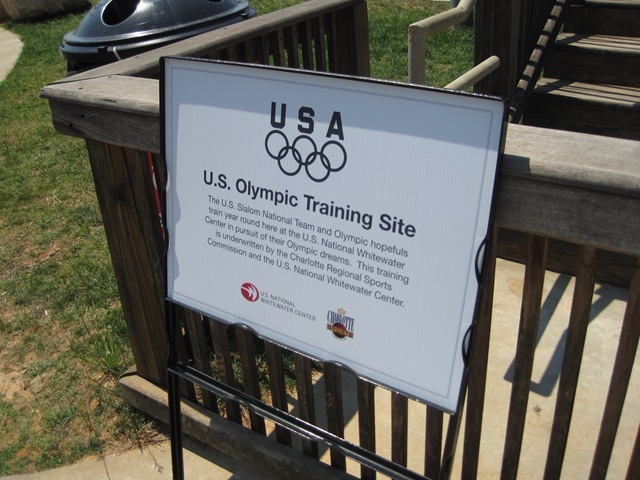 Did you know that the U.S. Olympic athletes train here? Cool! 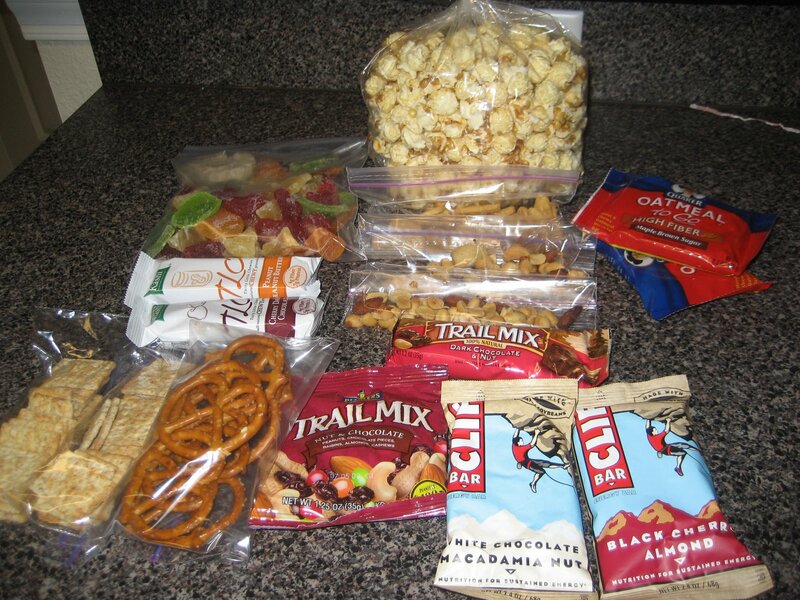 I am currently writing this last Road Trip blog as Jason finishes up packing the car… aaah gotta hurry! 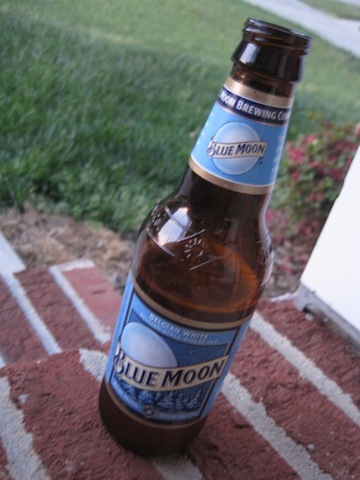 What do you look forward to most about coming home from a road trip or vacation? In the meantime, be sure to check out Kelly‘s Trader Joe’s Giveaway! Good morning! It’s really early, and I’m about to hit the road. 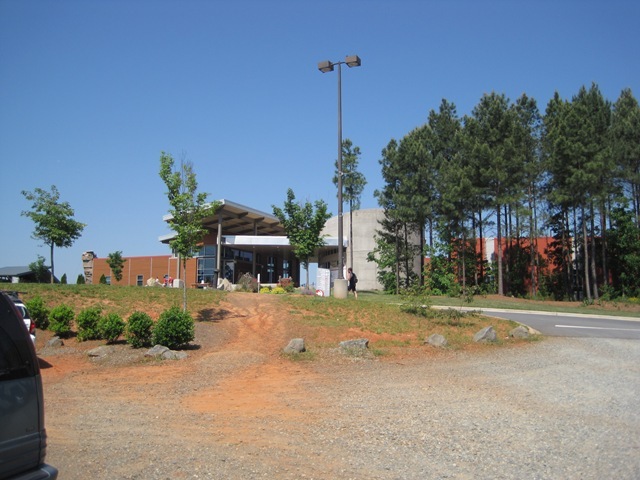 My mom and I are headed up to Greensboro, NC where she lives (she flew down Wednesday night). I’m taking her home and picking Jason up at the airport. He is currently in Columbus, Ohio shooting pictures for Rock on the Range. This is such a new experience for me! I always thrive on schedules and love planning every last detail (I guess that makes me a better engineer, but not always so fun). This trip is SO the opposite of that. I’m excited to see what happens!! I thought it would be really hard to pack for it but I basically just threw a bunch of clothes in the suitcase b/c I figure I can wash them since we’ll be mainly staying with friends or family. Last night’s dinner was created by my wonderful momma as I packed my suitcase for the two-week trip and attempted to tidy up the apartment. 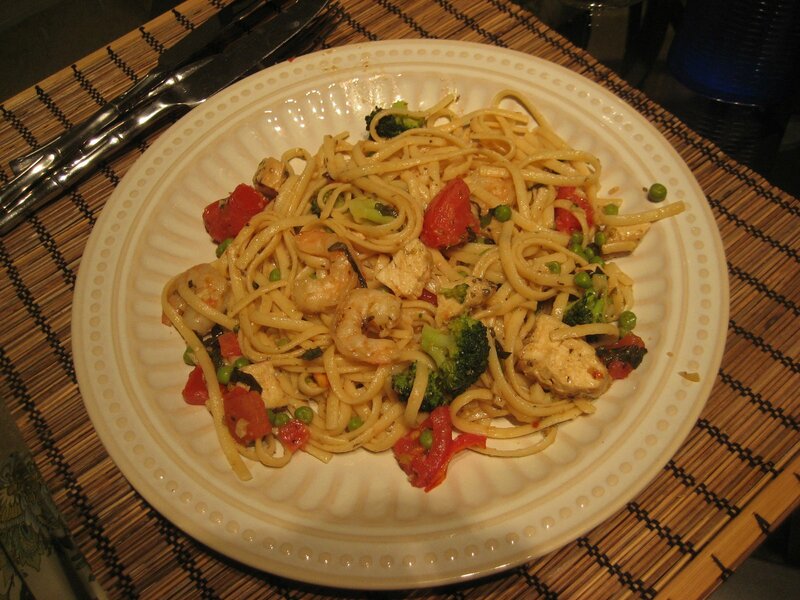 She used the rest of my leftovers and the few things we picked up earlier in the day to whip up an AMAZING Italian dinner. I’m so excited!! I’ll be blogging on the trip, so be sure to check back.